A dealer is randomly chosen who shuffles the cards and deals six to each player. The cards are dealt out three at a time to each player. The rest of the cards are put out of play until the next hand. Players look at their cards and try to figure out how many points (see scoring section) they think they can win with their hand. Starting with the player to the left of the dealer each player makes a bid from three to six. A player can pass on their bid if they don’t think they will score enough points. Players bid in a clockwise direction with each player having to either raise the bid or pass. When the bidding gets back to the dealer, the dealer has the option to match the high bid, raise the bid, or pass. If no players end up bidding in the round, the dealer must bid at least three points. The player who bids the highest gets to pick the trump suit for the hand and starts the hand. Each hand will involve six cards being played. To start the hand the player who won the bidding plays the first/lead card. The other players in a clockwise fashion play one of their cards. Players have three options of cards that they can play. If they have a card of the trump suit they can play it but don’t have to. If they have a card that matches the suit of the lead card they must play it unless they have a trump card to play. If they don’t have a trump card or a card that matches the lead card, they can play any card. Once all of the players have played a card you determine whose card won. If one or more cards of the trump suit were played, the highest card of the trump suit wins (aces are high). The current trump suit is diamonds. The lead card is a spade. The three of diamonds would win the cards because it was the highest trump card played. If no trump cards were played, the highest card of the lead card’s suit wins. The current trump suit is not diamonds. Since no one played a trump card the player who played the ace would win the cards since it is the highest non trump card played. The player whose card won gets to take all of the cards played and puts them into a face down pile off to the side. The player who won gets to play the next lead card which starts the next trick. This continues until all the cards have been played. Taking the highest trump suit card. Taking the lowest trump suit card. Taking the Jack card of the trump suit. If the Jack card of the trump suit is not played no one scores this point. Taking the six card of the trump suit. If the six card of the trump suit is not played no one scores this point. Taking the most game points during the hand. Each player adds up the game points from the cards they took during the hand and whoever has the most game points gets one point. The game points that each card is worth is printed on the card. If two or more players tie for the same amount of game points, no one scores this point. Diamonds were the trump suit for this hand. The top player will score one point for getting the jack of the trump suit. The bottom player will get three points for the highest trump card, the lowest trump card, and the six trump card. Whichever player won the last trump would get an additional point. Neither player would get a point for the most game points since both players had 11 game points. Players add the points they earned during the hand to their current total. The player that won the bid then determines whether they met or surpassed their bid. If they got as many or more points than they bid, they earn additional points equal to the number they bid. If they did not reach their bid they lose points equal to the number they bid. If no one meets the winning conditions, a new hand is dealt out with the player to the left of the previous dealer becoming the next dealer. Two conditions must be met for a player to win the game. A player has to have twelve or more points. The player has to have bid the most in the previous round and met their bid. If a player intentionally prevents a player with more than 12 points from winning a bid by purposefully bidding high, the game ends when there is a 12 point gap between the player with the most and least points. At this point whoever has the most points wins the game. 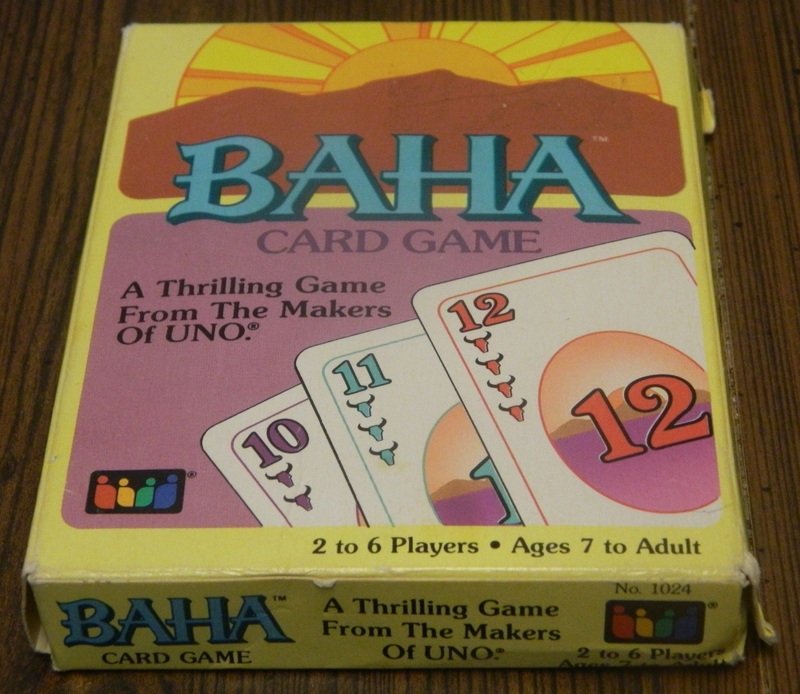 One of the most popular types of card games is the trick taking game. The trick taking genre involves players playing cards with the highest card taking all of the other cards. These games usually involve a trump suit that beats cards from every other suit. Despite playing several trick taking games in the past, I have never really been much of a fan of the genre and I have yet to find a trick taking game that I really enjoyed. I remain hopeful that I will find one though so whenever I find a cheap trick taking game I pick it up hoping to find one that I would really enjoy. I was hoping that Pitch Six would be that game but unfortunately it wasn’t. Pitch Six plays like your traditional trick taking game. Pitch Six only has three areas where it slightly differs from other trick taking games. First Pitch Six lets you play cards of the trump suit whenever you want. In a lot of trick taking games you have to play a card of the lead suit if you have one even if you have a card of the trump suit. I like this change since I think it slightly reduces the amount of luck in the game. Since you can play trump cards whenever you want you can end up winning hands that you otherwise wouldn’t have won. The problem with this rule though is that it becomes even more important to get dealt trump cards to be successful in the game. The second difference is the scoring system. I found the scoring system in Pitch Six to be kind of strange. The scoring system does force players to try and get both high and low valued cards of the trump suit as well as cards that give you game points. This makes you have to think a little more about which tricks you want to win. The different ways to score seem kind of random at times though. I can see the reason behind getting a point for having the highest trump card, lowest trump card, winning the last trick and getting the most game points. Getting a point for winning the Jack and six of the trump suit are kind of weird though. These somewhat random ways of scoring points makes it a little hard to remember how to score points for your first couple of games. You adjust to the scoring system but it kind of feels unnecessarily complicated in my opinion. The final “unique” mechanic in Pitch Six is the bidding mechanic. The bidding mechanic is crucial to the game and yet I think it could have used a lot of work. The bidding mechanic is so important because getting to choose the trump suit is crucial to winning a hand. If you have a bunch of high valued cards of one suit and that one suit isn’t the trump suit you will score next to no points. If you can win the bidding though you could score a lot of points. The problem with the bidding system is that it is really hard to know what to bid during a round. A considerable portion of the deck won’t be involved in the round so you don’t know where you stand among other players. Your hand could be really strong if you control what trump suit it chosen but you can never be sure unless you were dealt an amazing hand. The problem is that you have to bid at least three points or you have to pass. It is really hard to get even three points so this stops a lot of players from even bidding in a round. I don’t see players ever bidding five or six points unless they were dealt an amazing hand. It is so hard to guess how many points you can actually earn in a given round which makes the bidding phase just a guessing game. This means that the first person to bid and the dealer have a huge advantage in a given round since the bid rarely goes above four. Winning a bid can help or hurt a player significantly. If you make your bid you will easily score the most points in a round but if you don’t meet it you are guaranteed to score the least points for the round. I get the reasoning behind the bidding since there has to be some way to determine the trump suit but I think the bidding could have been improved. I don’t know what exactly could have been done but something is missing. While it makes bidding hard I actually like the idea that not all of the cards are used in a hand. The fact that the players don’t know what cards are actually in play makes players unable to know their true standing for a hand unless they were dealt an amazing hand. It makes playing cards interesting since you don’t know if a player is holding back a higher valued card when you are contemplating playing a card. Unless you have the card or it has already been played you have no idea whether another player has it or if it is even in play for the current round. This uncertainty adds to the game in my opinion. Like with most card games, the player who gets dealt the best cards will likely win any given hand. Getting a good hand is key because you want to be able to bid for control but you really can’t if you weren’t dealt good cards. A player that is dealt a bunch of low valued cards will likely do nothing during the round and score no points. Any low valued card that isn’t of the trump suit is pointless. While skillful play of your cards could get you one or two additional points than you would have otherwise gotten, I really don’t see anyone ever winning the game without getting dealt the best cards. 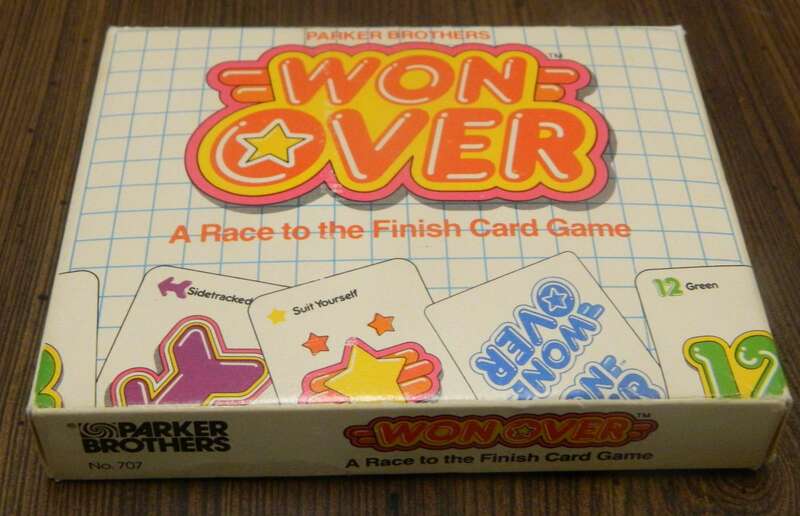 The final complaint I have with Pitch Six is that it is actually a public domain game and there is actually no reason that you need to purchase the Parker Brothers version of the game. All the game comes with is a standard deck of playing cards. You can play Pitch Six with any standard deck of playing cards. I admit that the artwork on the cards is really nice and it is helpful to see the little green numbers on the cards which help in calculating game points. Since the only differences are cosmetic though I don’t really see any point on purchasing the game unless you can find it for really cheap. Pitch Six is your typical trick taking game with a couple small tweaks. If you have played a trick taking game before you know what you will get out of the game. 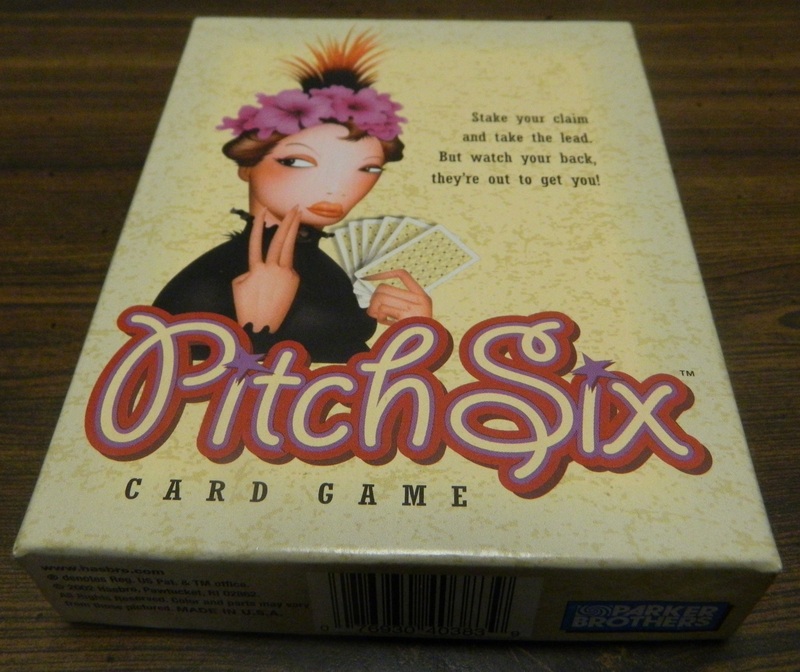 If you don’t like trick taking games I don’t see you liking Pitch Six either. 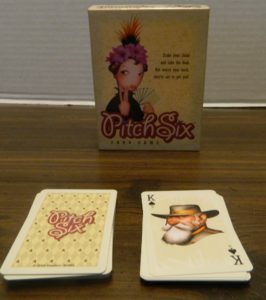 If you like trick taking games you will probably also enjoy Pitch Six. Since you can play Pitch Six with any standard deck of playing cards, it is hard to recommend purchasing the Parker Brothers version of the game. If you like trick taking games you will probably enjoy the game but you could just play it with a standard deck of playing cards. The artwork is quite nice though so if you can find the game for really cheap it may be worth picking up. If you would like to purchase Pitch Six you can purchase it on Amazon here . Pretty easy trick taking game. Not much different than a typical trick taking game. Card draw luck determines who wins the game.